The pattern was modified from here to incorporate bobbles. I started the repeat of the pattern at row 6 (56 around) instead of tow 7 (72 around). Then at row 12 added a bobble every 8th stitch (7 dc between each bobble). The bobble row was repeated every other row until I started with the rust colored yarn. do I ever have the ultimate acrylic stash-busting coming up! (Hey that's tomorrow, isn't it...Where does the time go? "A large ball of teeth that works with its buddies to eat the world of yesterday to make room for today." For many years I have striven to make things "match". I have come to the conclusion that "matching" is too much pressure and sort of boring anyhow. I am now on a "coordinating" quest. I'll see how that works for me and report back. and the Urban Slouchy Hat Pattern from here. It is thick and it is warm! the Diversity Scarf from this post. Pattern for the "Urban Slouchy Hat" found here. This time I dug into the wool pile, not to be confused with the wood pile. Yea, another random statement, but I like the way it sounds. This one is for the NVO. and it has been so pretty! and a "hurry up and get the winter projects done"
This is what was left of the cotton stash a few weeks ago. These two cotton hats polish up every last bit of what was left here. Don't see anything?...that's because it is gone!!! but now I am all out of cotton. they do not know what they want! I'm stash-busting like there's no tomorrow. Remember that challenge I threw out there from this post? I challenged anyone to beat my time making a rose. 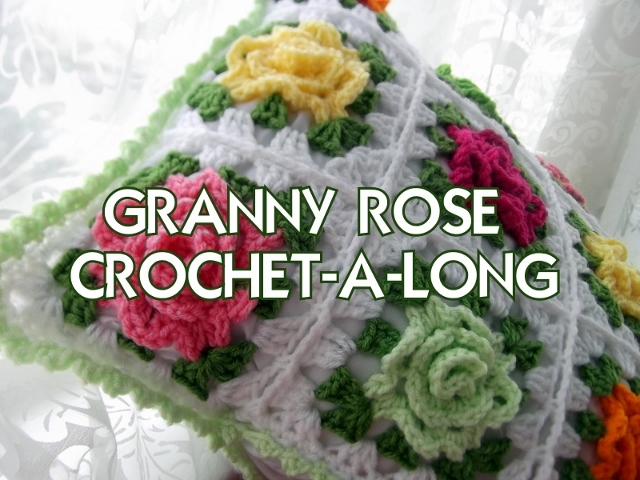 I have tried twice to break your amazing granny rose time, but the pressure got to me both times. My first time was 4:48, and my second time was 4:51. I started to get nervous, the yarn would start to squeak, my arms would start to shake, and I would make a lot of mistakes. I saw in the comments of your post that you told someone to email you the time anyway, so I thought I would do that as well. Here is a picture of the rather bedraggled-looking rose from my best time. I closed up the center hole after I had stopped timing myself so it would look better for the picture. ~ Claire (The Cogaroo) ~"
I'm not sure anyone can beat her time! and a little something for her mother, as well. I would venture to guess that Claire is my youngest follower. Claire, your rose is simply beautiful! email me your time and a photo. 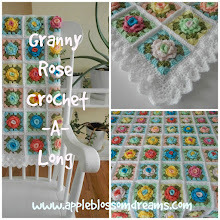 Click here for the rose pattern link. Note the empty coffee mug and empty cookie plate...they are empty because this is not real. 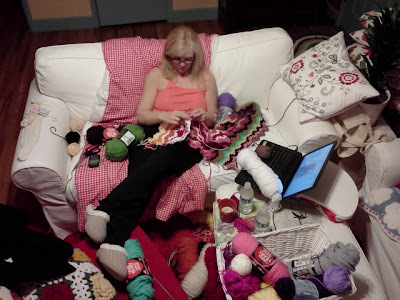 Note how the yarn and current project coordinate with room; this is also not real. And it's a stash-busting bonanza! No pride, I tell ya', no pride! I would love to hear about your reality. Have a fantasy filled day! That is NOT how long it takes to make 108 roses! THAT is why I am so smug fast. Difficult to believe, I know, but the NVO clocked my time. But I ran out of turquoise, so 108 it is! purchasing a skein of turquoise to make one rose in order to have 120.
white, aqua and pastel violet. 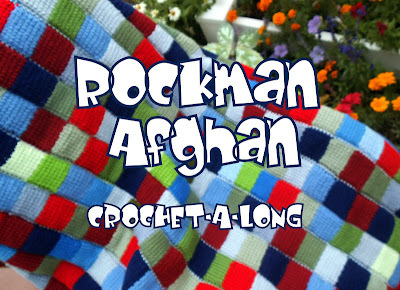 Afghan will be 9 x 12 rows of colorful fun! is done for this CAL gal. 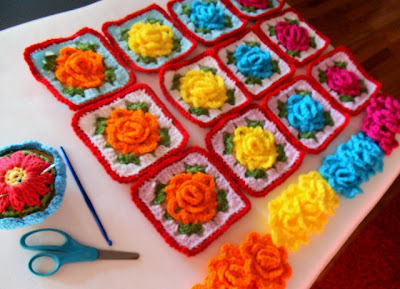 Want to learn to make roses fast? Click here for play-by-play instructions, then practice, practice, practice. The first one to beat my record will win a prize! If re-visiting a project that has been put aside and stashed away for a while counts for stash-busting than this is also a stash-buster in addition to a record breaker! I had to get creative with the pattern to use up these last little bits of these colors. 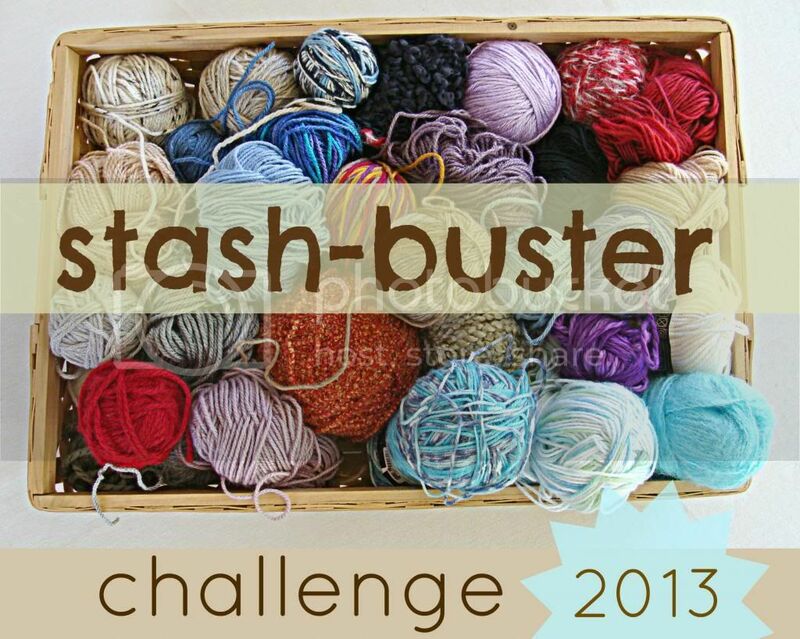 Thank you for joining me on the stash-busting via the dishcloth journey. But I am still...stash-busting like a mad woman!